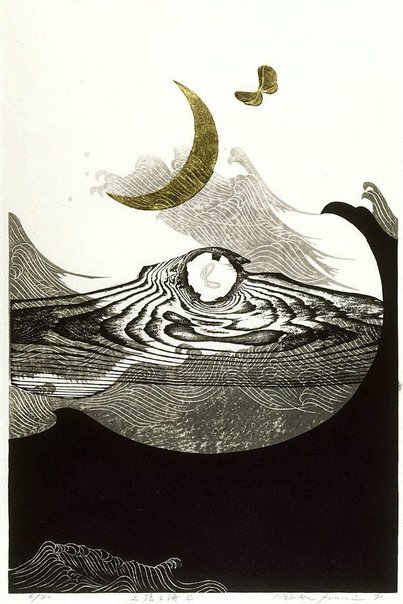 Born in Manchuria, and educated at Bunka Gakuin College, Iwami now lives in Kanagawa Prefecture near the sea which is the subject of most of her prints. Her commitment to prints developed after she discovered the work of the great 'sosaku hanga' artist Onchi Koshiro (1891-1955), and studied under his student Sekino Jun'ichiro (b. 1914). Iwami avoids the use of colour and the majority of her prints are produced in shades of black, grey and white, with goldleaf accents, and embossing. All her prints incorporate the use of natural driftwood, an effect which, allied with her use of goldleaf and embossing, emphasises the texture of the print. She combines her varied elements into refined compositions that echo her joy at living by the sea between heaven and earth, and express in their fluidity her belief that music and water are one. While the driftwood pattern in this print is a novel device suggestive of ocean currents, the style of the waves is very traditional, reminiscent of ancient designs on folding screens, textiles and lacquer. The butterfly motif is also an ancient one in both China and Japan. Its use as a symbol of summer and emblem of joy can be traced back to the writings of the famous Daoist philosopher Chuangzi (329?-286?BC), and has been a continually popular decorative motif in Chinese and Japanese art ever since. Iwami's belief that contemporary Japan is a continuation of its history is perfectly exemplified in the synthesis found in her own refined and decorative work. Jackie Menzies, Contemporary Japanese Prints: The Urban Bonsai, 1992, pg. 36, 53. Signed and dated l.r., pencil "Reika Iwami '91".